Blown-in insulation produces a tighter fit than traditional insulation materials which keeps more airflow out. It fills in all the tight spots that other insulation materials can’t possibly reach. Small corners and crevices get sealed, not just the outer layer. The tighter the fit, the more insulated your home is. Blown insulation seals all the small cracks in your home. Because of it’s tighter fit, blown-in insulation also keeps more moisture out of your home. Moisture is bad for insulation. In fact, too much moisture can render your insulation useless. Keeping the moisture out helps prevent other issues that can be expensive to repair. Blown-in insulation is more energy-efficient than other types of insulation. The tight seal and quality materials used to manufacture it will keep your home warmer in the winter and cooler in the summer. This can only mean good things for your energy bill. While your neighbors bills continue to rise, yours will be lower. Drop clothes and runners are put down to protect your house from job related debris. Cellulose insulation blown in to specified R-Value. 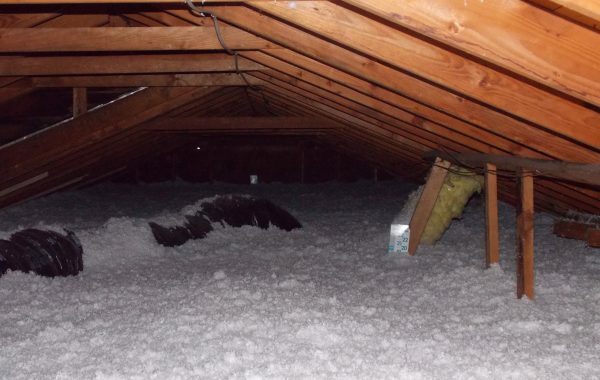 Bringing your attic’s insulation up to code, can save you thousands on your heating bill over the long run, as well as keep your home cooler on those few (but often unbearably) hot summer days we get up here in the Pacific Northwest. Cellulose insulation is good for the environment and good for you and your family! As it is made from 75-85% recycled newspapers (plant fibers) it reduces waste and promotes sustainability within the building industry. Cellulose requires much less energy to produce and also doesn’t require the use of any aerosol blowing agents to apply. These nasty, toxic gases (hydrofluorocarbons and chlorofluorocarbons) have been identified to have hundreds or even thousands of times the global warming potential of carbon dioxide. Cellulose insulation is also treated with boric acid, which gives it the highest (Class 1) fire safety rating. Boric acid is so effective as a flame retardant, it is even used in fighting forest fires! Boric acid is also a superior control against mold, and studies have shown that even with several months of direct water saturation and improper installation, mold still did not grow. But don’t be scared of boric acid either, it is about as toxic as table salt. The biggest advantage of cellulose is that it is much less hazardous to our systems than fiberglass. Cellulose is categorized by OSHA as a dust nuisance, but that just requires that we wear a dust mask during the installation. Cellulose insulation is also locally-sourced, so we’re not burning fuel shipping it in, and we’re keeping jobs in the local economy! By comparing snow accumulation on the roof you can see how insulated your attic is. 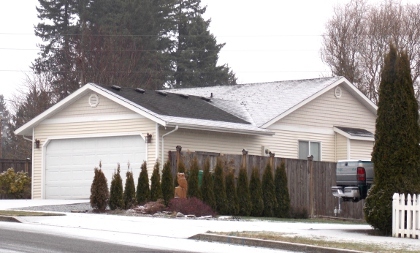 If the snow is melted off, the heat from your home is going right through your roof (and not staying inside your house to keep you warm) and some new attic insulation might be a good idea. Notice here how the snow is collecting over the house but not over the garage. This is because garages frequently have open rafters and thus no insulation. However if the snow is piling up on your roof and your house is still staying cold, its likely not your insulation. In this case, your home may require new energy-efficient windows or doors. If you have concerns or know anyone looking to improve the comfort and efficiency of their home, give us a call. We provide complimentary energy and and weather-safe evaluations.